Although cell death has been recognised since many years as a component of tissue injury in many diseases, until recently cell death was considered a consequence of the pathology. However, recent studies from many labs including ours provided evidence that cell death can be a potent trigger of inflammation. In particular, lytic forms of cell death such as necroptosis or pyroptosis are thought to be highly inflammatory by mediating the release of intracellular components that act as Danger Associated Molecular Patterns (DAMPs) from the dying cells, which activate immune responses in bystander immune cells. Our research provided evidence that necroptosis is a highly inflammatory type of cell death that potently drives inflammation in vivo (Welz et al, Nature 2011, Bonnet et al, Immunity 2011, Dannappel et al, Nature 2014). Apoptosis has been classically considered a non-immunogenic form of cell death because the ordered disassembly of apoptotic cells minimises DAMP release. However, our research showed that under certain conditions apoptosis can trigger potent inflammatory responses and cause chronic disease, suggesting that also apoptosis can be highly inflammatory (Kumari et al, eLife 2014) although the mechanisms of apoptosis-induced inflammation remain elusive. Our current research focuses on dissecting the mechanisms by which necroptotic or apoptotic cells trigger inflammation in vivo, aiming to exploit this knowledge for targeting cell death-mediated pathogenic responses that are implicated in the development of inflammatory diseases. The immunostimulatory properties of dying cells are believed to depend on the release of DAMPs. Necroptosis is a lytic type of cell death resulting in rapid loss of plasma membrane integrity and thus causes the massive release of DAMPs that fuel inflammation. 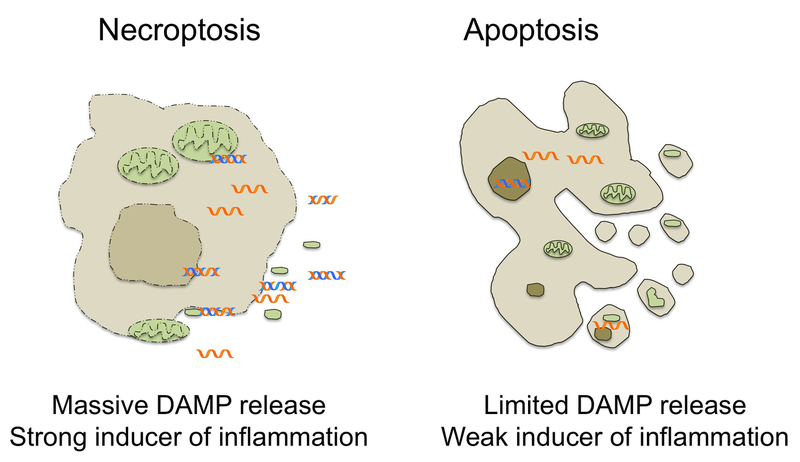 In contrast, during apoptosis the cell contents are contained within apoptotic bodies limiting the release of DAMPs therefore apoptosis is considered a weak inducer of inflammation. However, the specific role of DAMPs and the mechanisms of cell death-induced inflammation remain poorly understood (Pasparakis and Vandenabeele, Nature 2015).